Recently I got a mail from one of the reader. She asked; How could be launch Call Task from Secondary Tile? In this post I am going to show the way to do that. Before you go ahead with this post, I strongly recommend reading below three posts for more on Live Tiles and Call Task. Idea of launching Call Task from Secondary Tiles is very simple. On NavigatedTo method of the Page1.Xaml, we will instantiate Call Task and show call panel to user. Let us create Secondary Tile on MainPage.Xaml. I have put a button on MainPage and on click event of the button Secondary Tile will get created. If you notice in above code, I have set navigation to Page1.Xaml. Now on onNavigatedTo() method we need to write code to launch Call Task. I hope this post was useful. Thanks for reading. it is valid that after launching the PhoneTask, the app navigates to the Home Screen so that when the user is done with the PhoneTask, he/she lands in the Home Screen instead of in a page of the app. 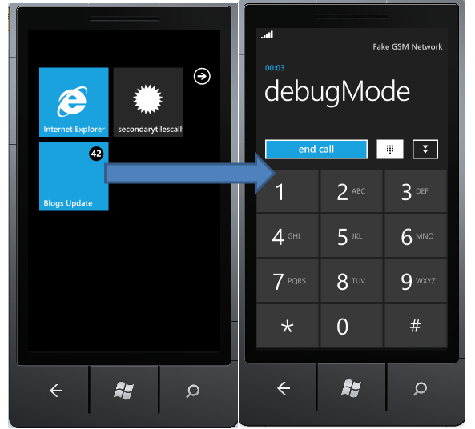 (something like using the secondary tile as a direct access to the PhoneTask). p.s. : sorry if my english is not very good. I would also like to add a point to the post .